One interesting thing about Auli is that over here you will get the best of both the words – snow peaked high mountains and also apple orchards and pine trees. During winters you can enjoy snow all around the place and during summers you can get lost amidst the picturesque mountains. This guide will answer all your questions about this place, from Auli’s weather, how to reach from Delhi, best to visit it and accommodation. Auli is famous as a skiing spot of India, which is connected with two cable cars running – one from Joshimath and another one in Auli itself. In here, you will be able to see the snow-capped beauty of Garhwal Himalayas, along with Nanda Devi, Mana Parvat and Kamat Kamet. There are several places to see and experience in Auli. It is a really small place and reaching from one location to another is easy. It also offers a breathtaking view of several mountains so it is easy to sit and have tea and relax. Below you will find all the details of the places you can visit in Auli. Auli has the world’s highest man-made lake. It is so picturesque and beautiful, lying right in the middle of the slopes and high mountains. The reason behind the construction of this lake was to produce snow even during the summer time which makes it the perfect place for skiing as well as for the winter games. Auli provides beautiful panoramic views of the mountains from wherever you look. From here, you can see the second tallest mountain of India – Nanda Devi (the sleeping beauty), along with Mana Parbat and Dronagiri. The best part would be if you experience these hill station during the winters as the mountains are painted beautifully with snow, making it glisten amidst the sun rays. So there are two ropeways running in Auli. One is known as Gondola – Asia’s longest ropeway that stretches from Joshimath to the skiing spot, covering a track distance of 4.15 KMs in 22 minutes and costs around INR 700/-. The other one is the chair car ride of INR 300/- which stretches from GMNV to Auli. Another difference between the two is that Gondola is a small cubicle which is covered with glass windows; tourists stand inside it and covers a stretch of 5 KMs, however, chair car is an open stack of chairs (literally). How thrilling, floating midair and seeing patches of snow and greenery down below you in open. Auli is regarded as the best destination for skiing in India and one can ski here all around the season as the artificial lake here helps in making the snow during summers as well. One can ski here as a professional or as a tandem. The tandem ski costs around INR 400/- per hour per person. A person can also take a ski training program which is a 15-day program. The best part is if you are skiing for the first time, don’t worry, you can come here and trying skiing as the trainers are always with you guiding you on how to ski. If you wish to ski, the best place to do so would be in Gulmarg, Kashmir. Also read – Is It Safe to Travel Solo to Kashmir? In here, Vishwajeet and I screamed a lot of swear words to each other, for he was afraid of me slipping from the slope of this gigantic rock. Little did we know it would turn out to be an epic experience to climb it using both our hands and feet just to reach to the top and feel the fresh air of panorama. Auli can be visited all around the year, however, if you want to experience snow and cold, January and February are the best time for this. During these months Auli’s weather is colder as compared to the rest of the years. The temperature can also go in negative during the night time. Although if you want to escape the heat of your city, you can go in May and June to this location, however, snow will be dire at this time. The other months will give you pleasant weather and picturesque sites. The temperature is moderate as well. Basically, you can go to Auli any time, it will totally depend on the purpose and kind of weather you are looking for. But I would highly recommend you to avoid going here during the rainy season. Not only because Himalchal is prone to landslides, but also because you might be stuck in your hotel rooms due to rain showers. There is freedom Waiting for you On the breezes of the sky And you ask, "what if I fall?" Oh but my darling, What if you fly? The nearest airport to Auli is Dehradun – Jolly Grant Airport and from here one can either take a cab to Auli or follow the bus route that I have mentioned below. A side note though, the distance between Dehradun and Auli is around 300 KMs away. So I would strongly recommend taking a flight till Delhi itself as the commute is easily available from Delhi for Uttarakhand. You can travel through the night and cover major distance till Auli. There is no direct transportation to Auli from Delhi until you have hired your own private vehicle. Best is to reach either Rishikesh or Dehradun and take another mode of transportation from here. If you want to reach Dehradun via train, take Dehradun Shatabdi Express that reaches Rishikesh early in the morning. From here you can take a bus or a tourist car. I would suggest booking the train well in advance on the irctc website since the seats on trains book fast. Buses are the best option if you are on a budget. There are no direct buses from Delhi to Auli, however, you can travel to Rishikesh overnight and then take a bus from Rishikesh to Auli which starts early in the morning. The start point to take a shared taxi is Rishikesh. You can take any mode of transport to reach Rishikesh – either a train or a bus and from here you can opt for a shared taxi. We opted for a shared cab as well from Rishikesh to Auli that cost us INR 700/- per person. However, the price can vary between INR 300/- to INR 1,000/- depending on how good you are at bargaining. The bus leaves some time between 5-7 AM and costs somewhere around INR 300/-. Another option could be to take a bus to Joshimath which runs more frequently from Rishikesh. Further, then from Joshimath, there are numerous routes that you can opt – bus or a cab or a cable car. The distance between Joshimath and Auli is around 16 KMs. If you want the best of both the worlds, one option is to reach Joshimath from Rishikesh by following any of the routes – car, shared taxi, buses (as mentioned above). From Joshimath, you can take a cable car that costs INR 700/-. The gandola ride is the longest in the whole of Asia and definitely worth the experience. You can stay in Joshimath and travel from this place to Auli. But to really soak in the surroundings of Auli, best is to stay in Auli itself. We booked ‘Manik hotel‘ on the spot and got a room for INR 1500/-. You will also find resorts and other expensive hotels here. However, since Auli has a limited option to stay, it is best to book beforehand during peak seasons, as well as, during extended holidays. While the number of days can be extended as per your preference and things you want to do. If you want to commence on treks, you will be needing more days of course. Below, I am providing the itinerary for those who want to explore only the areas in Auli. Like I said above, you can follow several routes to reach Auli. You would be able to find a shared taxi easily. Buses leave early in the morning. Once we reached Rishikesh bus stand, we had a cup of tea and snacks at the dhaba which was right outside the bus stand. Although buses were available for Joshimath, we took a shared cab since it would have been faster to reach. Note that, you will only be able to reach Auli by afternoon. So today, it would be best to relax in your hotel and soak in the surrounding viewpoints which are absolutely gorgeous. Today, after breakfast, go to the cable chair for a ride which will take you to a little height. From here, you will be able to see the man made lake. Walk a little towards the left and you will reach the skiing point of Auli. Even if you are not a pro at skiing, there will be guides to help you with your first experience. Remember, it gets a little cold as you reach a height. Do carry warm clothes and jackets. You will also be able to find 2-3 food joints that serve snacks and tea. Alternatively, if you are in Joshimath, you can take the gandola ride that takes 25 minutes to reach Auli. It directly stops at the skiing point itself. Auli is famous for its spiritual presence as well. There is a Hanuman temple here and it is believed that in Auli, Hanuman Ji rested here when he was carrying ‘Sanjvini’ herb for Laxman. Mythology says, while fighting a war in Sri Lanka, Lord Rama’s younger brother Laxman was badly hurt. Only the ‘Sanjivini’ herb would have been able to cure him and this herb was only found in the Himalayan region. The bus leaves early in the morning from Auli for Rishikesh. However, here is a pro tip: If you are comfortable in a shared taxi only, best is to take the number of the driver that dropped you off to Auli on the first day and make arrangements with him to drop you off till Rishikesh as well. Well if you are travelling here during winters the temperature goes down to as low as -8° C, thus it is essential to keep all these during that seasons, however, in summers the temperature goes up till 20° C. Below, I am providing a checklist that you should take with you in Auli, whether winters or summers. This, right here, took my breath away. I think Auli is the best place to go to for four days, and especially during the winters. It is not only picturesque but a perfect getaway for adventurous activities like skiing. If you are planning to go here, just go ahead with the plan without giving a second thought. How much time does it takes from Rishikesh to auli via bus or cab? It takes around 7-8 hours via cab and 9-10 hours via bus. Could you please elaborate the dates part? Its amazing information provided . Thank you. Need some advice on the travel piece.. We are planning for the 1st week of Dec and want minimum travel since travelling from Delhi. Do we have option to carry our own tents ? hi ! 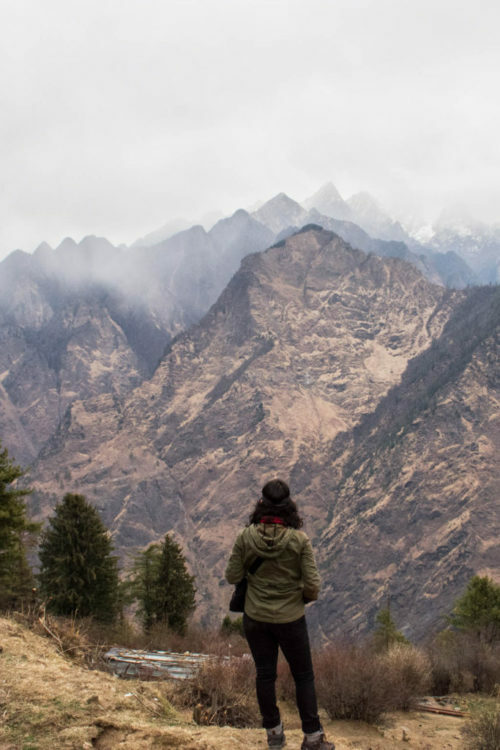 loved this blog, i’am planning a trip to auli soon, just wanted to know where do you stay? Well drafted write-up and nice capture.